FOSSIL SMART WATCH Q WANDER ROSE GOLD. Condition is Used. Dispatched with Royal Mail 1st Class. Fossil Q Wander Smart Watch. Condition is Used.Straps are interchangeable. Dispatched with Royal Mail 1st Class. New listingFossil Q Explorist HR (4th Generation) 45mm Case Men's . Only a few months old . From a smoke free home . Fossil Q Explorist HR (4th Generation) 45mm Case Men's Smart…. Condition is Used. Dispatched with Royal Mail 1st Class. The photo is of the actual watch as eBay used a generic description . Grab a bargain cost £240 new . 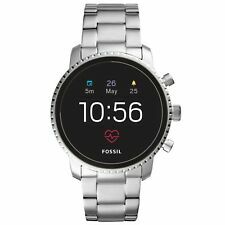 Fossil Q Explorist (Gen 3) Smartwatch – Smoke Stainless Steel - Great Condition! Condition is used. Worn for just over a year. A few minor wear & tear marks to the strap. Screen is in excellent condition as I have used screen protectors from new. Condition is used. No plugging or unplugging of cables required. Connectivity: Bluetooth® Smart Enabled / 4.1 Low Energy. Match your watch to your mood or personal style and swap your dial whenever you want. Fossil Q Marshal Smart Watch, Brown Leather and Black rubber strap, DW2A,PERFECT CONDITION ⌚. Condition is Used. Fossil Q Wander Smart Watch Rose Gold. Condition is Used but perfect. Dispatched with Royal Mail Tracked. This watch is in perfect condition and has only been worn a handful of times. The watch strap is brand new. Comes in original packaging equipped with charger. A really great smart watch with the ability to display notifications, control your music, microphone and speaker, activity tracking and interchangeable watch straps. Hello, For sale is a ladies Fossil Q Venture HR (4th Generation) 40mm Smartwatch. The Buy It Now price represents a saving of over £120 off the Argos and Fossil price online. Its also swimproof too; now your watch can join you at the poolside. Compatibility: Android™ OS 4.4 (excluding Go edition) and iOS 9.3 . Fossil Hybrid Smart Watch Rose gold Works With Mobile Phone RRP£109 In Sale! No plugging or unplugging of cables required. Connectivity: Bluetooth® Smart Enabled / 4.1 Low Energy. Match your watch to your mood or personal style and swap your dial whenever you want. The choices are endless. Bargain catch! In very good condition with new leather Darlena strap (not quick release type!). No scratches on the dial. No box, no accessories. Works fully but no watch spring rod included and you need to buy it (available for £1). Fossil Q Explorist HR (4th Generation) 45mm Case Men's Bracelet/Link Band.... Condition is New. Dispatched with Royal Mail 1st Class. Q54 PILOT - FTW10043 GEN 1. CHRONOGRAPH DIAL. MADE OF BLACK STAINLESS STEEL. 22MM STAINLESS STEEL INTERCHANGEABLE STRAP. BNIB FOSSIL Wearables. Syncs to smartphone via Fossil Q App. 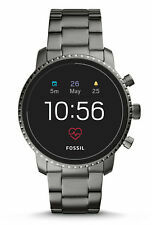 Fossil Gen 4 Smartwatch - Explorist HR Black Silicone. Condition is Excellent. Classic Design. Modern Tech. WORN FOR LESS THAN AN HOUR. GEN 2 SMARTWATCH - Q MARSHAL GUN SMOKE STAINLESS STEEL. Link to the Fossil Site As new condition, due to personal preference of wanting an analogue watch, this watch has been worn on two occasions and hence in mint condition, the screen protector has never been removed. Fossil Q Marshal Smart Watch with Upgrade Fossil Genuine Smoke S/S Strap. Condition is Used, but in very good fully working condition. A screen is free of any scratches marks. Only a few scratches on a casing. Make and receive phone calls. This watch was £165 when bought. I’m a girl selling a mans watch so not sure I know much about it . No son the back 5 ATM. All Stainless steel . 1341702 . Fossil . 22 . Watch screen is perfect condition. Case Colour: Silver. Case Size: 44 mm. Text and Voice: No. Notifications: Yes. Touchscreen: No. Heart Rate: No. Outside Temperature: No. 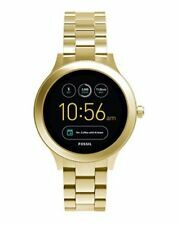 Fossil Q Venture Unisex Smartwatch Gen 3 - Gold-Tone Stainless Steel Case and Bracelet. A smartwatch that (actually) looks the part. • Microphone - Use the built-in microphone to do a variety of tasks on your smartwatch using just your voice. Does not include any accessories. FOSSIL Gen 3 Smartwatch Q Explorist Navy Leather / Men's Smartwatch Compatible with Android and iOS - Activity Tracker, Smartphone Notifications, Water resistant Always connected: With the latest Bluetooth smart enabled technology and compatibility with Android OS 4.3 and iOS 9 / iPhone 5 , keeping up with fitness and tracking activities just got easier Never miss a goal: Q Explorist will inform you of any notifications on your phone, and giving control over your music, taking a photograph and other tasks available through the inbuilt microphone Completely customisable: Make it yours by personalising the smartwatch face, features, apps and the watch straps - which are interchangeable Items delivered: 1 x FOSSIL Smartwatch Gen 3 Navy Leather, 1 x Wireless Charger (USB Type), 1 x Quick Start Guide. Smartwatch is used just few times, excellent condition, all working. Box and charger included. Great fashion & tec peice with great functionality. Fossil Q Marshall Smartwatch. Smartwatch requires Wear OS by Google to pair with phone. We will do our utmost to resolve any issues. Due the very nature of batteries, we are unable to accept any responsibility for battery life. Connectivity: Bluetooth® Smart Enabled / 4.1 Low Energy. For sale we have a used Fossil Gen 3 Q Venture Smart Watch. This stunning rose gold plated sand strap Gen 3 smart watch is the perfect accessory for your busy lifestyle. Bracelet Type Leather Strap Clasp Type Traditional Tang Buckle. Unwanted Christmas present. Worn twice. In mint condition. Bought for £279.99. Connectivity: Bluetooth® Smart Enabled / 4.1 Low Energy, Wi-Fi 802.11 b/g/n. Compatibility: Android OS 4.4 (EXCLUDING GO EDITION), iOS 9.3 . MPN FTW4018. Man Smartwatch Amoled GEN4 Fossil Collection Q Q Explorist Hr. Ring made of stainless steel with a satin finish and glossy black. The strap is black rubber and interchangeable buckle. Swimproof, water resistant up to 3 atm. Fossil Connected Touchscreen Smartwatch FTW4003 with brown leather strap. Kartice for Fossil Gen 4 Q Explorist HR Band,22mm Fossil Gen Q Explorist Gen 3 Bands Leather Band with Stainless Steel Buckle for Fossil Q Marshal Gen3/Fossil Gen 4 Q Explorist HR SmartWatch. 【Compatibility】The Fossil Gen 4 Q Explorist HR band is precisely designed for your Fossil Q Marshal Gen 2/Q Founder Gen 2/Q Wander 2,and Fossil Q Gen 3 Explorist/Q Grant Hybrid. Personalize your Fossil Q Explorist with this refined strap compared to Apple ones, but at much less price. PRODUCT DESCRIPTION Classic design. modern technology.his 45 mm Explorist HR touchscreen smartwatch & egrave; featuring a smoky gray steel bracelet and allows you to monitor your heart rate, receive notifications, customize your watch face and much more. Smartwatches with Wear OS by Google technology are compatible with iPhone & reg phones; and Android & trade ;. Wear OS by Google and other related trademarks are registered trademarks of Google LLC. Touchscreen smartwatches with Wear OS by Google require a phone running Android 4.4 or later (Go Edition excluded) or iOS 9.3 or later. The functionalities supported may vary by platform. Only use the included charger to avoid damaging your watch. Do not charge with a USB hub, splitters USB cables, USB Y cables, power banks or other peripherals.